대한위암학회 34회 학술대회에서 멋진 특강이 있었습니다. 강사는 동경암센터에서 많은 한국외과의사를 지도하기도 하셨던 유명한 외과의사 Keiichi Maruyama 선생님이셨습니다. 선생님은 한국을 매우 사랑한다고 언급하시면서 "Necessity is the mother of invention"이라는 말로 강의를 시작하셨습니다. 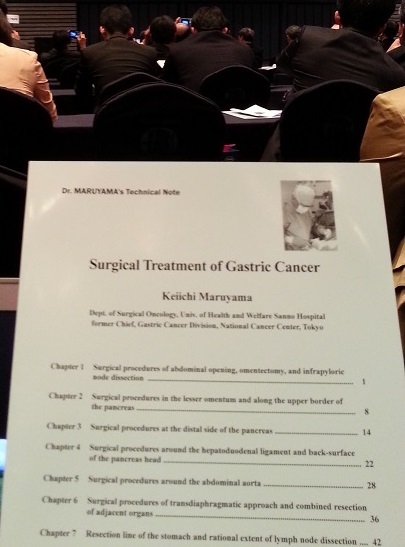 강의 직전 'Surgical treatment of gastric cancer'라는 제목의 책을 한권씩 나누어 주셨습니다. 선생님께서 개발하고 사용하신 술기를 많은 그림과 함께 상세히 설명한 내용이었습니다. 놀랍고도 감사한 일이 아닐 수 없습니다. 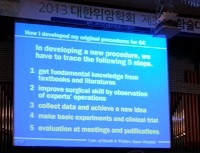 Maruyama 선생님 강의 key slide는 제목은 "How I dveloped my original procedures for gastric cancer"였습니다. 옮깁니다. In developing a new procedure, we have to trace the following 5 steps. I spent all my career for the treatment of gastric cancer since 1962; 10 years in the Keio University, 30 years in the National Cancer Center Tokyo, and 10 years in the University of Health and Welfare Sanno Hospital. I improved my surgical techniques by fundamental education and practice, textbooks and literatures, observation of surgeries by experts, and my own clinical ana basic researches. In this experiences, I understood the importance of the old proverb "Necessity is the mother of invention" to realize a new and original procedure. I prepare "Blue booklet, titled Surgical treatment of gastric cancer" to explain my surgical procedures using my own illustrations. I hope th booklet would be instructive for you. In my lecture, I would like to show my experiences "how I developed my new procedures". The procedures includes 1) systemic lymph node dissection under intraoperative lymphography, 2) pancreas preserving total gastrectomy, and 3) wound healing of the anastomosis and Gambee's one layer mattress suture techniques. You will understand the details of these techniques from the videos and the illustrations. 역시 surgeon답게 자신이 수십년간 사용한 도구들을 보여주면서 "I always use my instruments"라고 말씀하셨습니다. 강의 내용의 많은 부분이 해부학과 조직학에 대한 내용이었습니다. 수술 방법을 개발하기 위해서는 해부학이 기초중의 기초라는 것을 느꼈습니다. 자신이 개발한 (1) systemic lymph node dissection, (2) pancreas-preserving total gastrectomy with splenectomy, (3) wound healing을 위한 layer-to-layer approximation 등의 방법을 상세히 설명해 주셨습니다. 내과의사인 제게는 상당히 어려웠습니다만 선생님의 열정이 느껴져 좋았습니다. 마지막으로 Maruyama 선생님께서는 의미있는 comment를 남기셨습니다. "요즘 일본인 surgeon들이 상당히 lazy해졌다. 최근에는 한국과 이탈리아 의사들이 가장 active하다. 여러분들은 스스로를 proud하게 생각해도 좋다." 위암을 수술하는 우리나라 외과의사들이 정말 자랑스럽습니다.